I'm really looking forward to seeing this band with Good Old War in a few weeks.. Definitely some of the better up and coming indie pop.. and it's just a well done video. A friend noted that runners only like to blog about their weekly totals when they're doing well. Lately that's been true for me; between the excessive racing, and trying to build a base for Badwater, and still recover from each race, and taper for the next, but still be in 3 places at once.. And so those weekly totals weren't that great; I was learning a lot from all the races, but I was also lacking a consistent build. I accelerated my recovery periods down to a matter of 2-3 days, but I was never really ready for the comeback days when I'd try to put down a bigger run 5 days after a race. At any rate, it was imperfect, but it served to be a valuable learning experience: a marathon, two 50 milers, and a 100k in less than 3 months is a bad idea! So, with less than 2 months to go, I finally get to do something consistent to try to do my best to improve my road durability for Badwater. It's no secret: I hate roads, they hurt, they're boring, and my true love is technical single track. However, I've started to enjoy thinking about the fact that I have three LONG hills at Badwater (note, enjoy now, probably not during the race). Townes Pass (17 mi, 5,000ft, 294ft/m), Father Crowley Point (19 mi, 3,300ft, 173 ft/mi), and the Whitney Portals (13mi, 4,700ft, 361ft/mi). Unfortunately, I don't have much local stuff (other than AC) that features that long of a climb, but I do have some short and steep stuff. I have found a road shoe that I can run everyday in. Whatever all the hype/hate is about "dynamic stability" I find it to be smoother (hence the name "lunarglide") , and longer lasting. I have no problem with flats on trails due to the fact that I articulate my foot and arch more on trails, but roads lull my form to sleep and can give me IT, arch, plantar, and knee pain, thus the need for a little more stability. If you've never heard of them, they're Nike's 10.6oz trainer that launched last fall that has no air bag; just light lunar foam coupled with an extra wide fit. The yellow you see on the sole is the lunar foam, and the orange is the denser shell with a beveled arch to provide "dynamic stability" or what I consider, "shaped stability". The grooves cut out do increase the flexibility of the shoe a considerable amount, and give a much more natural feel than expected. I shaved a bit excess foam off the sides and back of the heel and toebox to lighten it up and give a bit more precise feel. The last is very wide, and the sole is even wider for both pronation and suppination control. 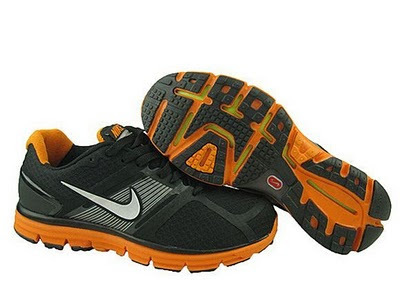 It has a good fit in the heel and arch with a wide toebox to prevent blisters. Most importantly it does great on the downhills even with over 700 miles on roads and trails in them. This morning I experienced possibly one of the most beautiful road runs of my life. The start on PCH at Tuna Canyon was chilly, overcast, and quiet except for the crashing waves. The climb was on a quiet one-way paved road, climbing 1250ft in the first two miles. For me, it drew allusions to sections of climbs one might find in le Tour de France. I was alone in the canyon, jacket, beanie (for heat training), and two bottles pushing myself up the hill in solitary pain and pleasure. Everything was still and misty as the road wound up and up along the walls of the canyon. There were no houses, no cars, just a paved road through the wilderness. As I approached 3 mi/1500 feet up, the road began to let up and I began to pick up pace as I began to punch through the clouds. I took in my reward of a stunning golden sunrise amplified by the thick white cloud layer reflecting the light like a snowfield. The views were almost impossible as every corner I turned exposed another stretch of sun soaked islands in the sea of clouds. Around 75 minutes in I saw the first cyclist on the ridge and we nodded at each other acknowledging the incredible moment nature was presenting us in exchange for our self supported climb up.. I crested the the top, 8.5 mi, 2,500 feet, 1:20 in, had a sweet n' salty bar and saltstick and turned around for a casual decent in 1:10. I'm really sorry I don't have any pictures from the morning, but this run will happen many more times with a camera hopefully. It's not ideally where I want to be right now, but I'm healthy and strong which is most important after so many races. My last finals are next week, then it's run, work, run. funny how the mileage goes through the roof after classes are out. I don't consider myself a high mileage guys personally but I still got 90 miles in the weeks school let out. The freedom is wonderful. I'm interested to see how that foam in those shoes holds up under the pavement heat Badwater has to offer. Sounds like you will do well, looking forward to seeing you out there! School shouldn't be such a limiting factor, but I just get concerned when I start to doze off during tests and start to think I have to do much less mileage. I'm looking at 15-20 miles a day through the summer, 100-140 mile weeks. I asked a rep about the lunar foam in high heat, and he didn't know as not many customers ask about 200 degree roads. I have others such as the New Balance 904 that I love.